Continuing our explorations into concert art, concert artifacts, Beatles-related bootleg experiment, here’s news about The “94.7 WLS-FM Rock & Roll Art Show” going on this weekend in downtown Chicago. 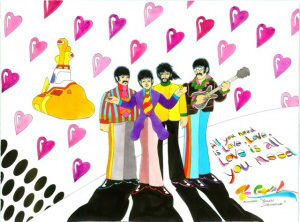 Ron Campbell, director of the legendary Saturday morning Beatles Cartoon series that aired on ABC from September 25, 1965 through April 20, 1969 and animator on the Beatles film Yellow Submarine will make a rare personal appearance at the “94.7 WLS-FM Rock & Roll Art Show”. In addition to his Beatles past, Campbell has been involved with some of the most beloved cartoons including, Scooby Doo, George of the Jungle, The Jetsons, The Flintstones, the Smurfs, Goof Troop, Krazy Kat, Rugrats, Winnie the Pooh, Ed, Edd & Eddy and dozens more. So we’re looking forward to hearing about his thoughts on creating live art during his favorite concerts, like this fan does. We’re told that Campbell will have many of his original Beatles paintings on sale created specially for this show and he will be giving attendees a live demonstration of his painting. What: The show is free to the public and all rock art works are available for purchase. When: Friday, November 5th and Sunday, November 7th 9:00 a.m. – 11:00 p.m. (9:00 a.m. – 6:00 p.m. on Sunday).